To judge for yourself whether inequality matters, just take a look at this comparison of what happens in college completion for the best scoring of low income kids vs. the lowest scoring high income kids. 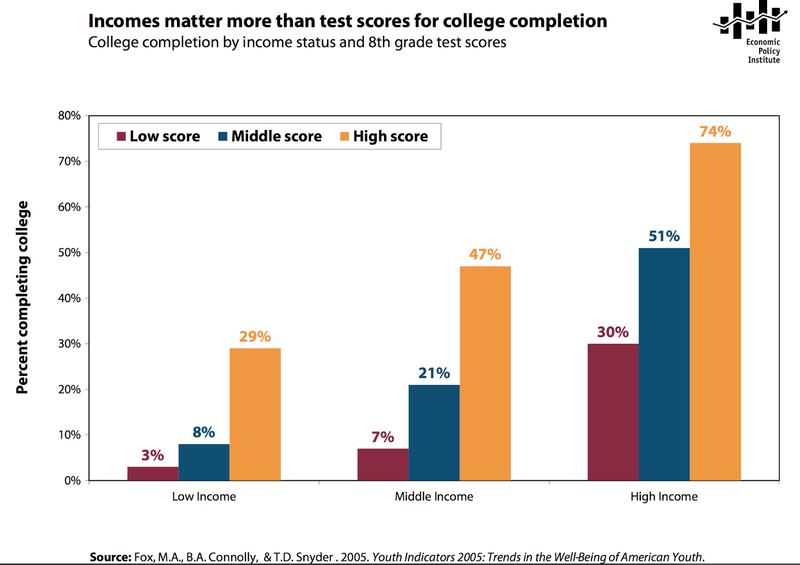 What happens is that 29% of the low income kids with highest scores complete college, while just about the same percentage (30%) of high income kids with low scores complete college. How can this be right? I assume we agree that graduating from college is highly determinative for the vast majority in regard to their future opportunity, range of choice in their lives, and success, no matter how each individual defines that. We all recognize there will be a small minority who succeed without college, a few spectacularly, but should this mean we can all bet on such rare proceedings? Business week reports that 19 of the Fortune 500 CEO’s have no college degree at all. But, 100 of them had degrees from just three schools–Harvard, University of Pennsylvania, and Columbia. Ivy League schools had a disproportionate share. In my post on public and private schools, also dated today, I comment on the exorbitant cost of private schools in Pacific Heights where I live. I believe these kinds of schools garner disproportionate shares of Ivy League admissions, and that an Ivy League degree is usually a ticket to a comfortable life, if not in fact, an outstanding financial success. The New York Times (August 26, 2014) reports that there has been little improvement in the admission of less well off students to selective colleges between 1990 and 2012–only about 15% of admissions are from a poor family background. To be fair, there are lots of reasons for this, and it’s not right to blame the universities for all of them. Some of it stems from the need to educate the students about those possibilities, while they are in high school. Many of the poorer families have a big need for someone with college experience and perspective to advise or even mentor their children, to get them prepared and encouraged to try for the best schools. Cost is not the main problem, since there is financial aid available, but it is also true that many colleges have to balance the low and no pay against the paying kids to achieve financial break-even. One example of how such support can be availed is described in another NYT article. “Communities in Schools” operates in 26 states, had 75% success in remedying cases of chronic attendance problems through mentoring and counseling, and claims a cost of only $189 per student per year. This is an example of the kinds of tools we can work with, even within our starved school budgets, with the help of community support organizations. I keep thinking we should have no disagreement between the rich and the poor on the importance of education. Isn’t this piece of it about “equal opportunity,” as distinguished from redistribution?